I’m continually amazed at how much a small theatre company is able to create with limited resources and a whole lot of energy and creativity. Slightly Askew Theatre Ensemble has been one of the more impressive smaller theatre companies in St. Louis, and I’ve never seen a sub-par production from them. 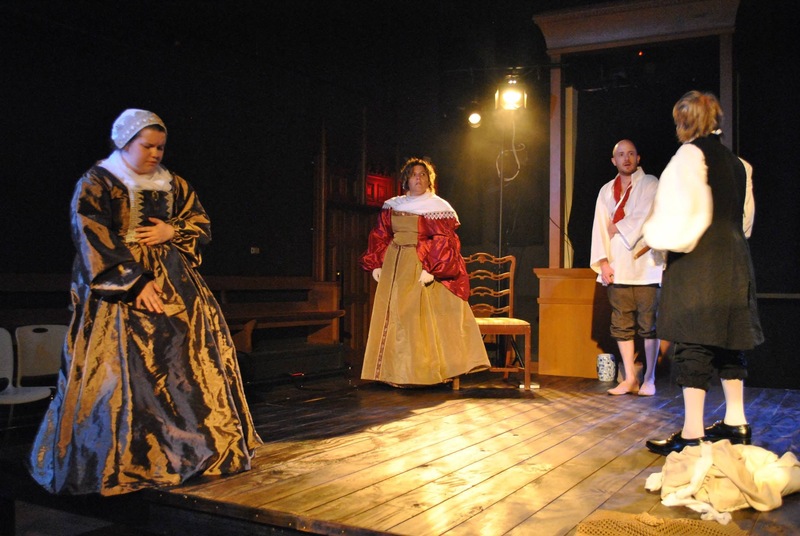 In their latest production, the historical drama One Flea Spare, the SATE team uses their usual performance space at The Chapel to its fullest potential, presenting an intense, disturbing and remarkable production that’s sure to keep audiences thinking. 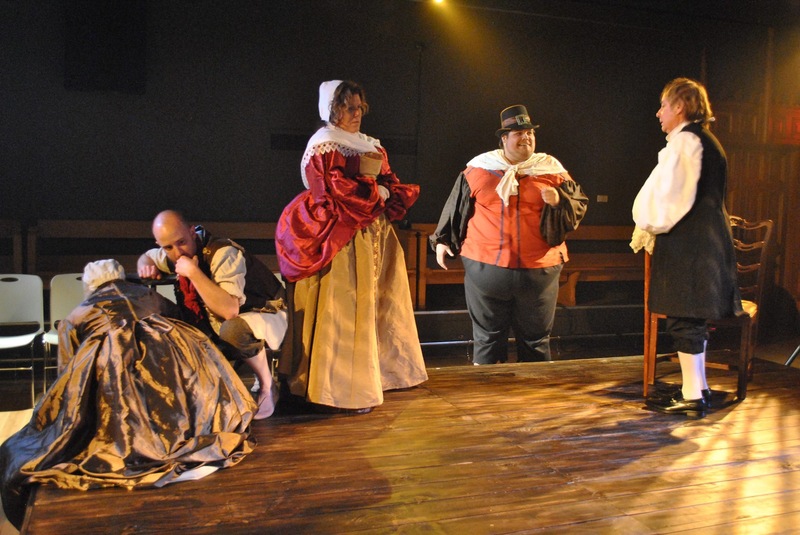 The subject matter for this play is difficult, as it’s set in London during the height of the Black Plague in 1665. A wealthy couple, William Snelgrave (Joe Hanrahan) and his wife, Darcy (Kelley Weber) are the only survivors of their household and are about to be released from a month-long quartantine when the arrival of two uninvited guests causes the local guard, Kabe (Andrew Kuhlman) to prolong their confinement. The two new arrivals, the young, mysterious Morse (Hannah Ryan) and the destitute sailor Bunce (Charlie Barron) upset the balance in the household and force the Snelgraves to take a closer look at their own identities and actions, as well as those of their new companions in light of the horrific tragedy that is engulfing their city. The set is stark and simple, designed by Bess Moynihan and director Ellie Schwetye. The basic wooden platform suggests the floor of the main room in the Snelgraves’ house. In the intimate atmosphere of the Chapel, this basic set is remarkably effective at bringing the audience into these characters’ world. The brilliantly striking lighting, also designed by Moynihan, adds to the atmosphere of play, and Elizabeth Henning’s extremely detailed period specific costumes help to further set the scene and mood. All of these technical aspects work together to augment the heightening drama of this memorable, expertly written and staged play. The drama here is in the conflict between the characters, and also their relationship with the increasingly gruesome outside world, with the realities of the plague and the presence of death in every street made all the more horrifying because it’s not directly shown. Instead, we see the characters’ reaction to their situation, and to each other. We see the initially genteel Snelgrave reveal more of his true character, along with his increasingly emboldened wife, the suspicious and desperate but concerned Bunce, and the deceptively childlike Morse, who serves as the play’s primary viewpoint character and shows that she’s a lot more clever than she initially may seem. As these four disparate characters get to know one another, and clash and conspire in various ways, they’re watched over by the looming presence of Kabe, the guard who has been put in the situation of holding the power over people who would normally have been considered his superiors in that society. It’s a rich, fascinating and occasionally highly unsettling character study, revealing how dire situations and close quarters can bring out all aspects, including the very worst, of human nature. The cast here is universally superb. As the play’s central character, the young and resourceful Morse, high school junior Ryan is a real find. She brings a determined, sympathetic and mysterious quality to the character, as well as demonstrating a fine singing voice in snippets of traditional folk songs that she sings at various moments. She presents a complex portrait of this character we get to know gradually throughout the production, in her compelling stories as well as in how she relates to the other characters. Kuhlman is also a standout at the superstitious, ubiquitous Kabe, displaying a strong stage presence and a thoroughly convincing Cockney accent. An unusual relationship develops between Bunce and the long-neglected Darcy Snelgrave, which is portrayed convincingly by Barron and Weber, conveying both characters’ regrets and losses with poignancy. As Snelgrave, Hanrahan does an excellent job of portraying the outwardly polite character–and his recurring mantra “I’m not a cruel man”–and the gradual revealing of his true character. All of these characters are nuanced and flawed, and each of the cast members portrays all of these aspects with supreme authenticity. This is a dark play, no question. It delves into a much written-about subject in a particularly personal way, letting us see what happens when people of different backgrounds are thrown together, but also what happens to society when such a major upheaval as a coutnry-wide epidemic takes place. SATE has brought this play to the stage with incredible skill and sensitivity. It’s another dramatic triumph for this company.